Zimmerman Trail is a two-lane road cut into the breathtaking sandstone cliffs known to those in nearby west Billings, Mont., as the “Rims.” This city-owned roadway is one of the few thoroughfares from the valley to the top of the Rims with average traffic count of 8,550 vehicles per day. 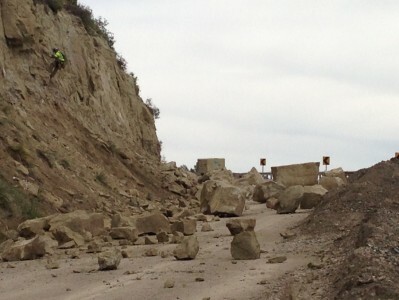 The roadway often experiences small rockfalls of boulders 1 foot or less in diameter, typically after significant rain storms, which are quickly cleared with little impact to traffic flow. The Montana Department of Transportation (MDT) and the City of Billings were planning improvements to Zimmerman Trail beginning fall 2014, and Terracon was scheduled to study the rockfall hazards along Zimmerman Trail and recommend mitigation measures at the end of the summer. On March 25, 2014, before the mitigation and design studies began, a 250-300 ton rock fell from above Zimmerman Trail and damaged the roadway and guardrails. Terracon was immediately called on to review the cliff face where the rockfall originated from, and found a potentially unstable rock mass still attached at the top of the slope. After consultation with City of Billings’ engineering staff, the roadway was subsequently closed as a result of the obvious hazard to public safety and welfare. The closure of Zimmerman Trail severely impacted travel within Billings. Safely reopening the roadway as soon as possible was a top priority. MDT, as the lead agency, contracted with Terracon as their engineering consultant, to expedite the project. The site had to be assessed and there had to be a plan to complete the project quickly and efficiently while being mindful of the safety concerns and threats this project posed. Terracon’s geoprofessionals in the Billings office have a long history of providing technical assistance to local government agencies mitigating rockfall hazards off the Rims. Past projects have included geologic mapping and inventory of rockfall hazards, emergency response, and design and construction oversight of mitigation measures. One project, an inventory of rockfall hazards along Zimmerman Trail in 2007, identified sever critical rockfall hazard areas. MDT called on Terracon to accelerate the Phase 1 site assessment. To facilitate the fast-tracked Phase 1, Terracon used an abbreviated field mapping and rockfall hazard identification program that mainly focused on the seven critical areas previously identified by Terracon in 2007. The field mapping and hazard identification program included scaling the cliffs to measure fracture widths and orientation and completing a detailed laser scan survey of the cliff face and the slope directly above Zimmerman Trail. The laser scan provided a detailed topographic map and cross sections of the slope and cliff face superimposed on a photographic base. Terracon completed a rock slope stability analysis to further evaluate mitigation requirements for critical areas. The first step was to evaluate whether orientation of the joints and fractures in the rock blocks, or their geometry, could actually lead to a failure of the block. This determination was made by field observations and kinematic analysis using stereographic techniques. Of the seven critical areas identified for further analysis, five areas were determined to have high potential for instability, requiring mitigation to reduce this potential before the road could be reopened. Terracon developed construction plans and specifications for the rockfall hazard mitigation program for contractor bidding. The mitigation efforts to address the five critical areas included hand scaling with scaling bars, pushing larger rocks off with air bags, blasting, and placement of rock bolts. Another important part of the mitigation process was the development of retention plans to prevent the rocks that were being pushed off the Rims from further damaging the roadway, an existing natural gas pipeline buried within the roadway, or private residences located below the roadway. 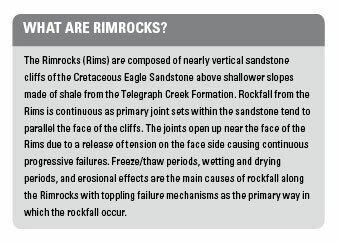 To model rockfall behavior at Zimmerman Trail, the team used a computer-engineering tool called the Colorado Rockfall Simulation Program (CRSP). Slope and rock properties were then determined from field observations, experience, and recommendations from CRSP literature. The simulations were further calibrated by modeling the rockfall event and adjusting parameters until the simulations matched the actual event reasonably well. The main goal of the simulations was to evaluate the rockfall runout at key cross sections above Zimmerman Trail to help determine if the roadway, or even the residences located at the base of the slope, could be impacted by rockfall generated during the mitigation measures. Various earthen berms were placed in areas where rockfall analysis indicated the potential for rocks to roll past the roadway, and were used to dissipate energy from the falling rocks. Additionally, a natural gas line was placed 4 feet below the roadway, and the dirt berms acted as a cushion to protect the line. The work consisted of removing and stabilizing potential rock fall hazards above the roadway. The loose and unstable rock fragments and rock blocks were stabilized by scaling, rock bolting, and blasting. The work site was exceptionally challenging due to close proximity of the residential homes located below the highway, city parks, and hiking trails below and above the site. Rock scaling and blasting required the utmost caution and accuracy. Terracon provided constant on-site oversight during the mitigation project. This allowed for in-the-field, real time engineering decisions to be made when an issue arose. The contractor, MDT, City of Billings’ engineering staff, and Terracon worked together on quality control as the scaling work was being completed. Throughout this entire project, constant communication and well-defined goals with bi-weekly updates were key to reopening this vital road quickly and safely. Working with MDT and the City of Billings, Terracon’s local knowledge and expertise in assessing and mitigating rockfall hazards allowed reopening of the roadway more than a week earlier than planned and within the client’s expectation for overall cost.